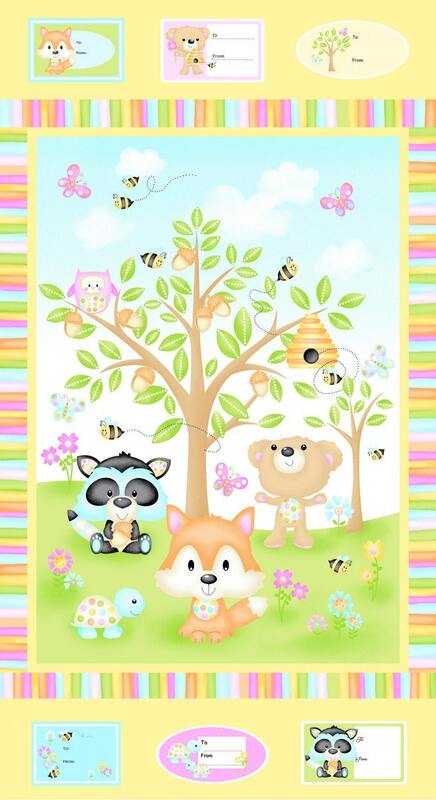 Designed by First Blush Studio for Henry Glass & Co, this cotton childrens print fabric collection features adorable woodland creatures in sweet pastel colorways. Colors include yellow, green, pink, orange, white, blue, orange, and tan. Panel measures 23.5" x 44. Such a fun cottonchildren's fabric panel to create a sweet quilt for a sweet little baby. Turn this panel into a baby gift in only a few hours. Add the coordinating fabric and Minky for the backing and you will have a soft quilt. All fabric from The Quilted Nursery Children's Fabric Store is cut directly from the bolt and sold by the yard. If you require special yardage please send us a message and we will be happy to accommodate your request. Same day shipping always! Sooo cute! Love this fabric.